Die Cast Machinery, LLC Buys, Sells, Appraises and Supplies used metal analysis spectrometers for trace metal analysis. We are a dealer specializing in second hand optical emission spectrometers (OES) used for base metal analysis of primary metal and secondary metal used in ferrous and non-ferrous foundry and die casting operations including spectrometers for aluminum alloys, zinc, magnesium, copper alloys and other metals. 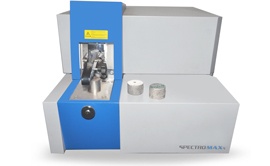 Spectrographs provide precision laboratory assay or metal analysis using analytical software. Technologies used in spectrometers include both Arc Spark CCD Detector Technology or photomultiplier tube (PMT). Both methods provide low detection limits and high accuracy. Spectrometers can be either stationary units, desktop units, portable (mobile) units and even handheld units used on the shop floor. Receive email alerts when new inventory matching Spectrometer become available? Recently Sold Listings in the Spectrometer category.